Spring Fevah! the only cure is… white wine. | the wine snob. Spring Fevah! the only cure is… white wine. I’m pretty sure I’ve used that tag line before… but don’t hate. Will Ferrell in a belly shirt hitting a cow bell never goes out of style. But as for today- we’re having a small and miraculous dose of SPRING in February! Isn’t it fantastic! I love how we, in South Carolina, act like it’s been suuuuch a long winter and we’re SO ready for Spring- when the poor souls in New England (and lots of other places, too) suffer a much longer and more brutal winter than we’ve ever even imagined. But be that as it may, we still get to throw open our windows for a few hours, air out the house, put a spring in our step and rejoice that we live in a Southern climate. Which is why I have had a serious taste for white wine the last few days! And even though those who know me know that Chardonnay is not exactly my favorite grape- I’ve found two that really put me in my place with their deliciousness! 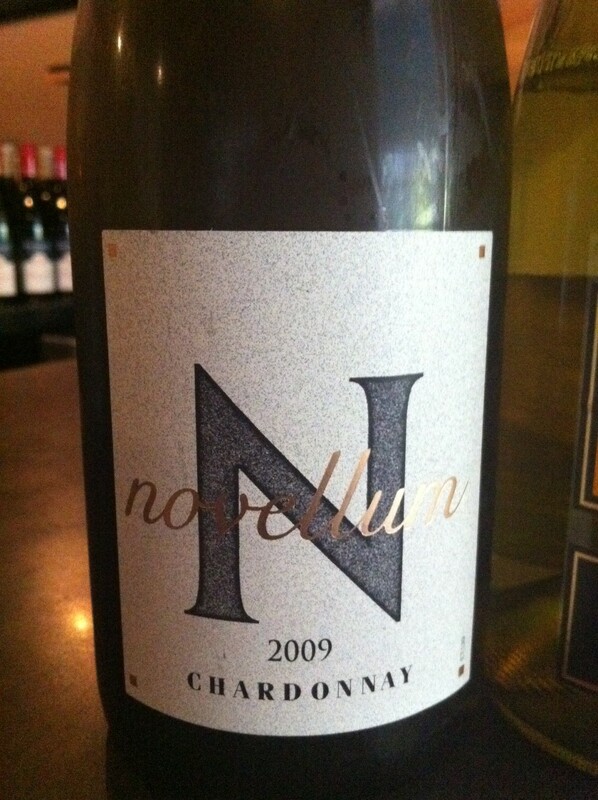 First is the Novellum Chardonnay, 2009 Vin de’Pays. I don’t think I’ve been this excited about a Chardonnay since the Chamisal Stainless I reviewed last year! First because it tastes good. But keep reading to find out the most awesome reason. Robert Parker said this about the 2008 vintage of this wine, which I’ll quote since I can’t really put it better: “The only reason not to enjoy this often over the coming year is if you insist on making an anti-Chardonnay or big-spending statement.” So, ARE you one of those people who will insist on making an anti-Chardonnay statement?? That is so uncool. Even worse are people who insist on making big-spending statements. Just don’t do it. Who are you really making the statement TO anyway? Anyway- lovely, lovely, and more lovely is this wine. Fresh, lively, gorgeous acidic and mineral content, and knock-out fruit- white peach, granny smith apple, tangerine, and a very pleasant hint of hazelnuts and light caramel. It’s 30% barrel fermented, which translates to a beautiful silky mouthfeel and viscosity. I really can’t say enough about this wine. Oh wait- yes I can! the best part… IT’S $11! Oh.Em.Gee. It’s really pretty stunning that this wine can be so good and so inexpensive. How do they do it?? Next is another perennial favorite in the unoaked California Chardonnay category- Four Vines Naked Chardonnay, 2009 Santa Barbara– worth mentioning because it’s also pretty darn good. And it’s $12! That’s nothing to sneeze at. Wine Spectator gave the 2009 vintage a nice little 88-point rating. 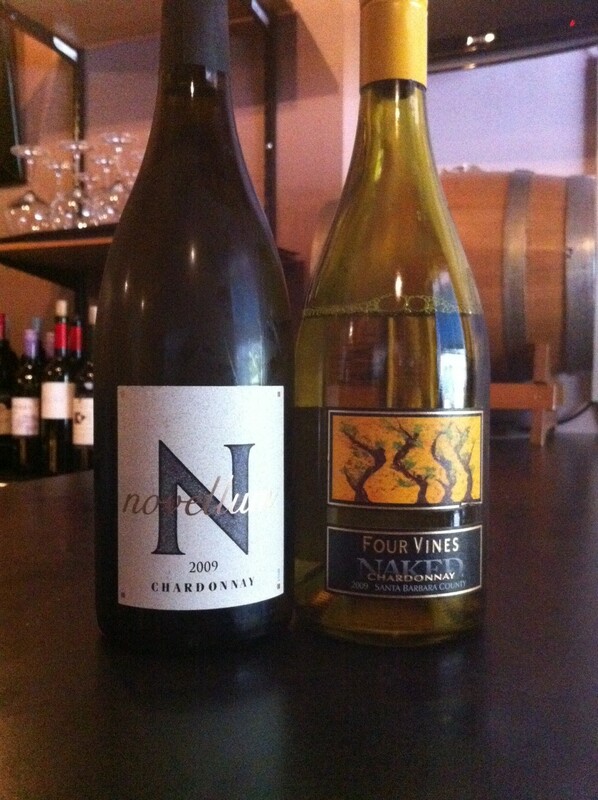 My taste generally points me more towards French Chardonnay, but the Naked is a pretty fun wine- more tropical than the Novellum, with lots of citrus, a nice quenching palate almost similar to a Sauvignon Blanc, and notes of pineapple, melon, and pears. A ripe, flirty little Chardonnay. This is the Chard that will leave you wondering why so many people hate on Chard. So lets hear it- why do you think people hate on Chardonnay? because Grandma drank it? because they tasted a really cheap disgusting one (or two or three) at some sort of function and decided it sucked? I’m curious. Before I sign off for today, a few items for consideration: the Novellum is available as part of our $90 Mystery Case this week (a new group of wines will be sent out today or tomorrow, but for last weeks- click here). Huh? you don’t get our wine club emails? Tsk tsk. $90 plus tax for a case of wine can’t really be beat, trust me. Email us if you want to sign up! Also it will be at the Wine Sale this Saturday the 19th (it’s supposed to be 75 degrees out! holla!) from 12-2. AND- check Cellar on Greene out in the Free Times this week! Bite of the Week- Duck Quesadilla.